I mean , you should find your varios needs with special deals with them easily ! Moreover , Their newest flyer is not limited to just wide range of product. You will come across amazing deals for many selected products on this flyer. It is possible to find good deals on every pages. I want to give you some advice for a good shopping. Cover page is one of the best pages to reduce to cost of shopping. Awesome options that you can save up to $1.67 for selected products are featured on this page. Many types of products such as soft drinks , bread , canned goods , meat , frozen food , coffee , fruit and packaged selection can be browsable here. All products are limited on this page. If you need them and you have a budget to buy more than these products , you should benefit these selections. For example ; if you buy Coca-cola drinks (12×355 ml) is $3.33. You can get a maximum of 3 at this price. In addition , Super fresh and good looking selection which are green and black grapes are drawing attention. 2 lb red or green seedless grapes only $2.97. 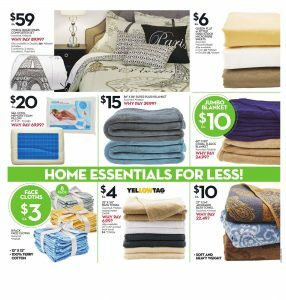 Life and pet essentials can be found on page 1. Selection of them is pretty quality. If you are looking for good prices for detergent , cleaner , paper towels , bathroom tissue , dish detergent , spray , kitchen catchers , here is good place for you. In my opinion , the best offers is for Giant Value paper towels or bathroom tissue for $4.47. When you buy it you can save up to $1.90. Also , a lot of good selections for your lucky are featured on page 1. Cat food , dog food , dry cat food , pet bed and more are waiting for you with reasonable prices on this page. If you have a cat , I can recommend Friskies cat food 2 for $1.00. When you buy it , you can save $0.68. You will also reach part of “Low pricec home deals” when you check on page 2. Various types high quality and usefull items such as dinnerware , utility mat , printed runner , small kitchen appliances , headphones , cookware set , outdoor led lights and luggage are available on this page. Their prices is quite fair. If you need some , you should benefit these prices. A lot of packaged and frozen products are on sale now ! You can find many frozen meal selection if you do not want to spend too much time cooking. Great solutions to pay less money for selected products are here! For example ; When you buy Giant Value frozen chicken breast for $7.00 , you can save $3.00. Let’s look at what products are on discount. For more deals , information and details , you can check all pages of this flyer. When you browse all pages , you will find more what you are looking for ! In addition , you can subscribe here and be informed about all advantages. Here you go and save your money !